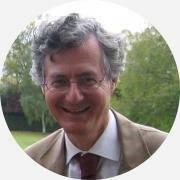 David Grech , a retired architect who had worked for English Heritage and Historic England, gave us an unusual account of three journeys that he undertook in Italy which he recorded with pen and brushes. We were treated to a delightful collection of his paintings. He had left a camera behind on a previous holiday and as a result now took his artist’s materials with him on his travels. He pointed out that recording a journey today is so easy with camera ‘phones, selfies etc. but painting makes him look closely at the sites with the curiosity of an architect, observing colour and texture. He feels that the human eye is more focussed than the camera. 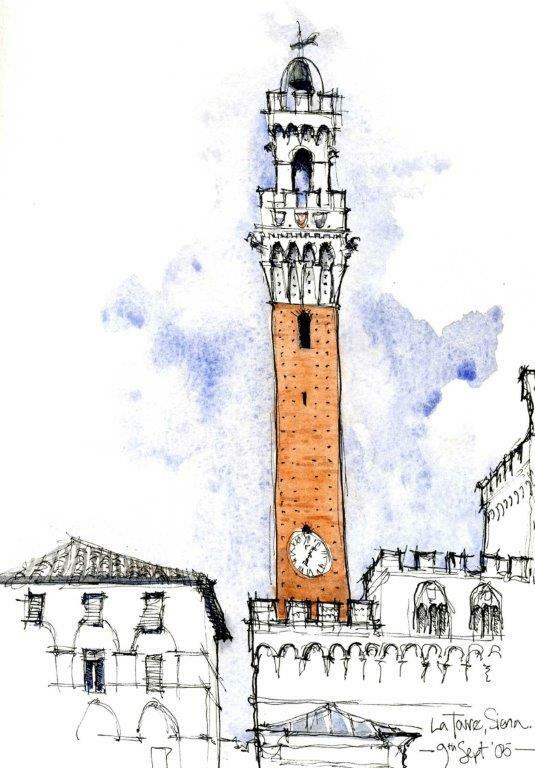 The first journey was a walking tour in the beautiful Chianti region commencing in Siena where his paintings contrasted the great Piazza del Campo and the narrow, shaded streets. Then through the surrounding rolling hills and vineyards there were opportunities to stop and paint, sometimes from a distance, hilltop villages, bell towers, a Benedictine monastery and the 11th century castle of Panzano in Chianti before arriving in Florence. 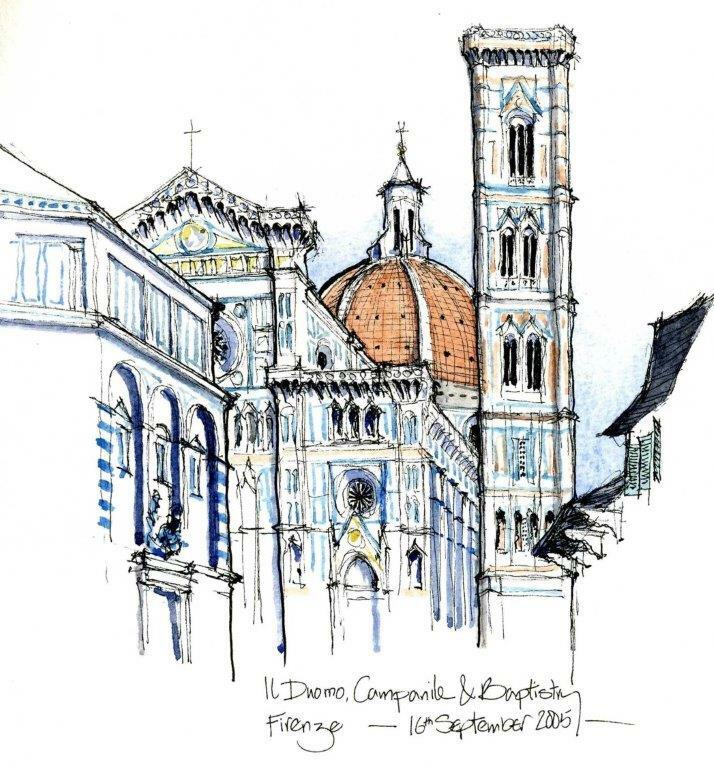 There, its Duomo with Brunelleschi’s dome provided an ideal subject and also led David to probe its method of construction with his architect’s eye. 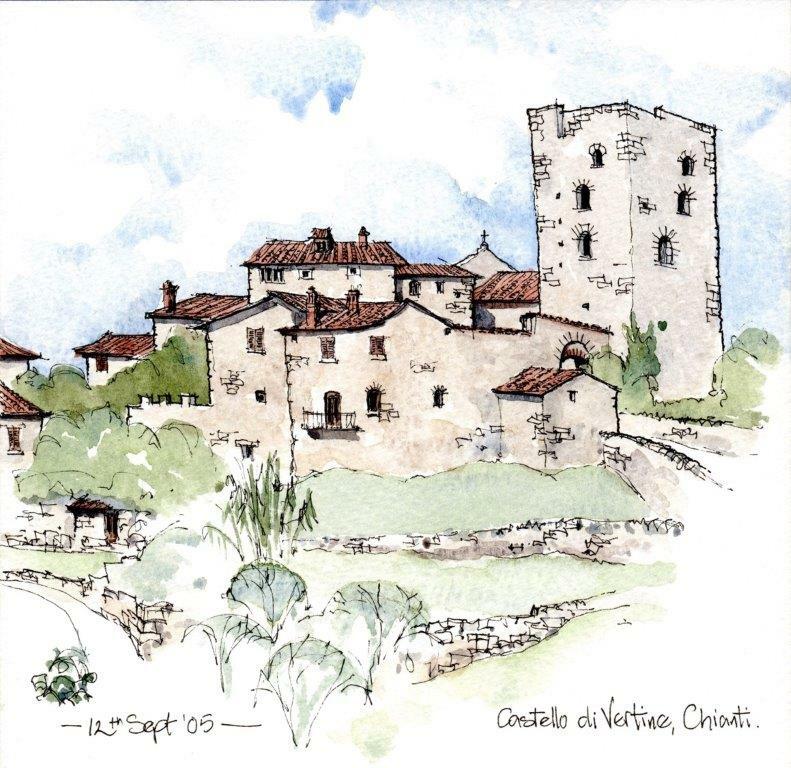 Then through the surrounding rolling hills and vineyards there were opportunities to stop and paint, sometimes from a distance, hilltop villages, bell towers, a Benedictine monastery and the 11th century castle of Panzano in Chianti before arriving in Florence.